This summer, Keystone Edge is hitting the road to share the stories of people across Pennsylvania working in economic and community development. As you’ll discover, this exciting field involves so much more than just sitting behind a desk — it requires engaging the community, forging connections, and tackling new challenges on a daily basis. The “Day In the Life” series is created in partnership with the Pennsylvania Economic Development Association and Team Pennsylvania. It’s a drizzly May day in the Lehigh Valley, and the Easton Public Market on Northampton Street, with its gleaming wood floors and airy white-painted beams overhead, is the perfect place to grab coffee and a salted-caramel pear muffin while sitting down with Jared Mast, executive director of the nonprofit Greater Easton Development Partnership (GEDP). 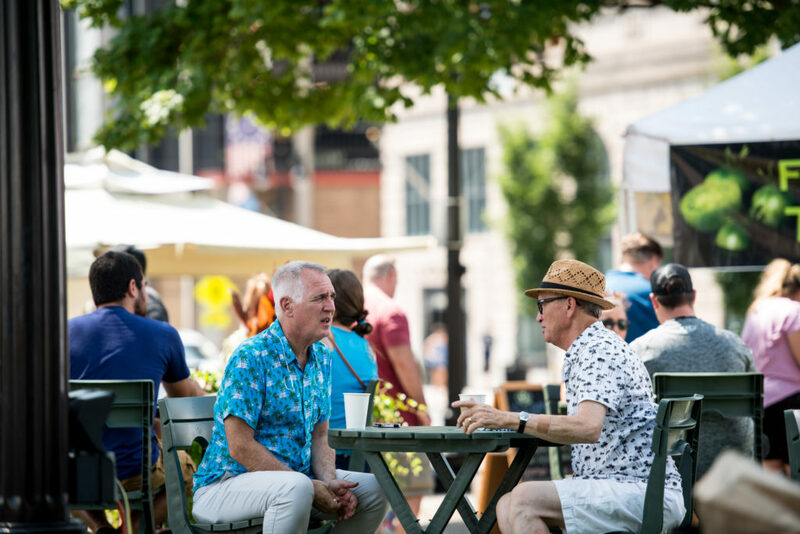 Sitting around a small table in a bustling food hall — one featuring vendors selling everything from ramen to Belgian chocolate to modern Egyptian fare — is an ideal setting to hear this message: 21st-century economic development probably isn’t what you thought it was. That’s especially important for a place like Easton, a city of 27,000 on the eastern edge of Pennsylvania. The burg sits right where the Lehigh flows into the Delaware — you can see Phillipsburg, New Jersey across the water. It’s a place with a lot of history. In 1736, a son of William Penn and his partner surveyed this tract of land. On July 8, 1776, Centre Square (still a community hub today) hosted one of only three public readings of the Declaration of Independence. Easton resident George Taylor was one of the signers of the Declaration, and his restored colonial-era home endures just a few blocks away. Over the next two-and-a-half centuries, churches, taverns, courthouses, shops, and homes made up the fabric of Easton. The historic façades of many original buildings survive along thriving corridors of restaurants and small businesses, including the Sigal Museum of local history, and the State Theatre. Before taking us out for a closer look at Easton, Mast grabs a spare umbrella in GEDP’s office, and we exit the market building onto Bank Street (a quaint brick-paved alley), then turn east toward Centre Square on Northampton Street. “Centre Square” is actually a bit of a misnomer — the square is a landscaped circle where Northampton meets Third Street. Its centerpiece is a 75-foot-hight granite monument (unveiled in 1900, almost 150 years after Centre Square’s creation) honoring Easton-area veterans who died in the Civil War. 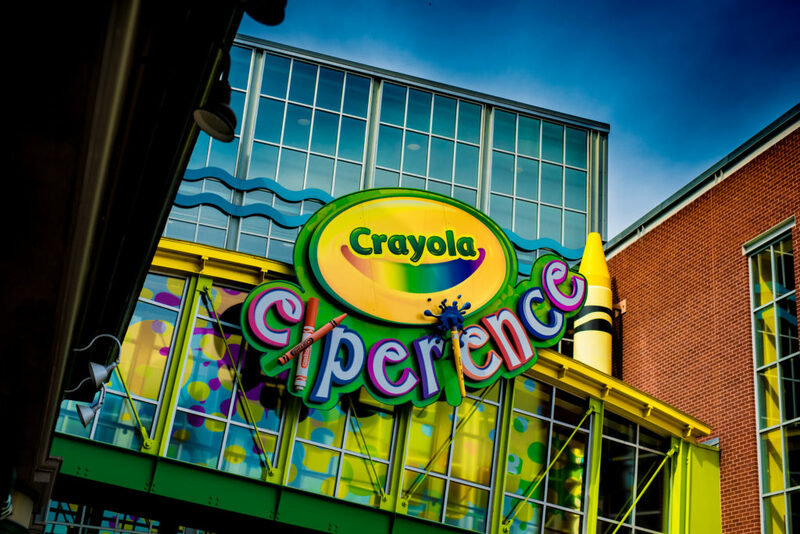 Giant crayons tumbling in mid-air mark the Crayola Experience, a family attraction from the iconic local company, as we head south on Third Street. On the walk to the waterfront, Mast points out the newly opened Northampton Community College Outreach Center. It offers guidance for prospective students, and there is a planned roster of community-centered programming including classes on computers, first aid, and cooking, plus summer camps and other youth activities. 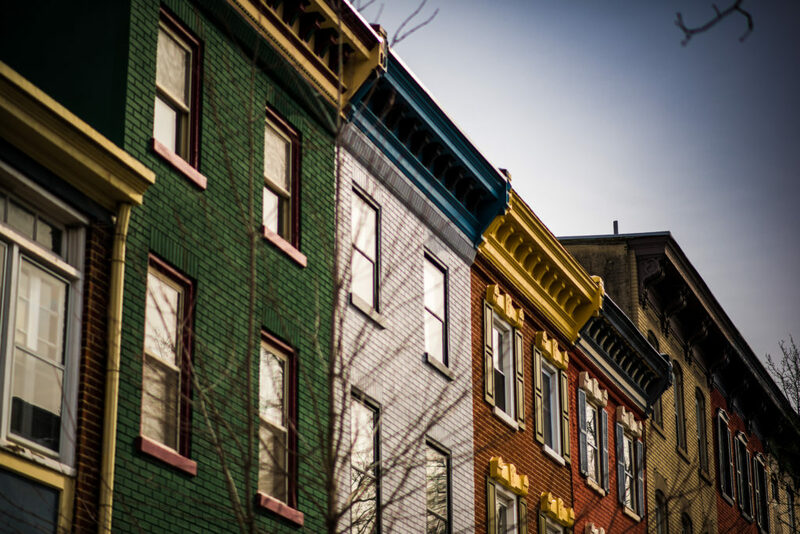 According to Mast, if you’re coming to study, live or build near Easton — an easy drive to both Philadelphia and New York City — it’s not about tax credits or massive new developments. Unlike its larger sister cities in the Lehigh Valley, Allentown and Bethlehem, Easton does not boast the population or infrastructure to support major corporate growth, the sprawl of luxury living, or massive redevelopment opportunities like Bethlehem’s iconic Steel Stacks. Instead, it’s about authentic quality of life. Organizations like GEDP augment that invaluable virtue by building connections. 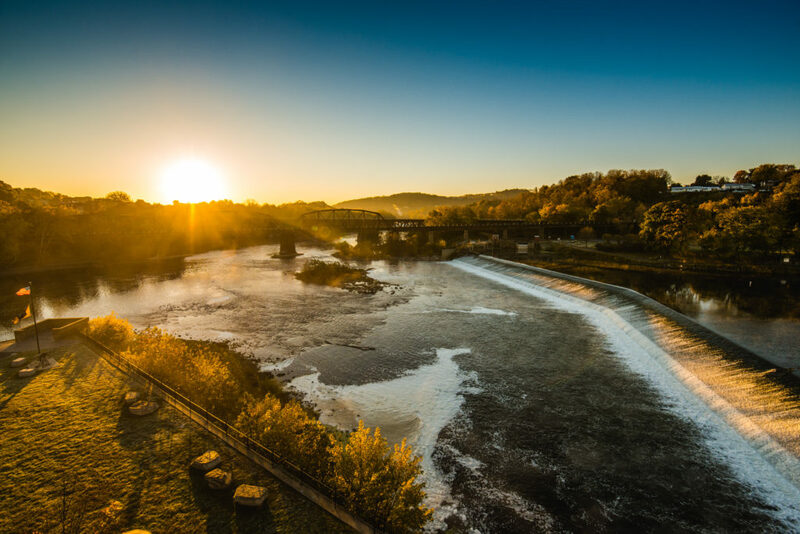 Mast calls it “creating wealth in the community” — and it means supporting new jobs, homeownership, parks and green space, events, small businesses, festivals, historic architecture, nearby colleges like Lafayette, and trails along the river. 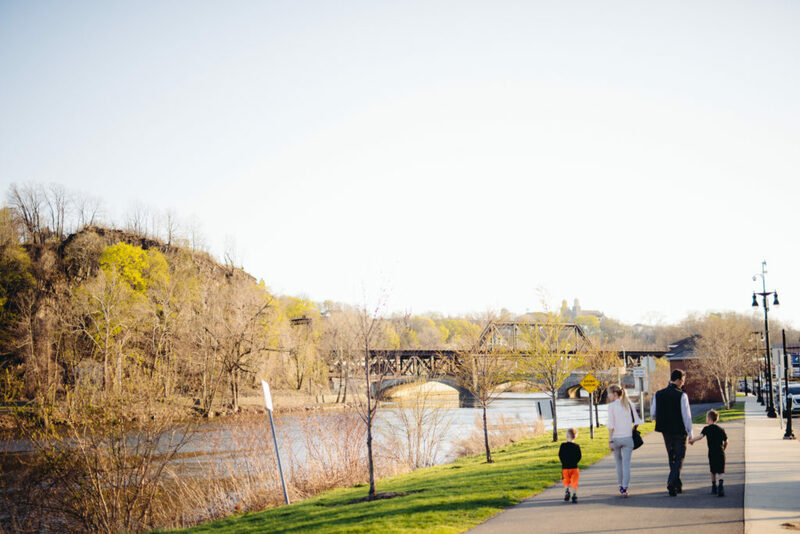 Where Third Street meets the Lehigh river — just before it joins the Delaware in what Easton locals call “the confluence” — we take a short walk northeast along Larry Holmes Drive (a piece of PA Route 611, which you can follow south all the way to Philadelphia’s stadium complex). 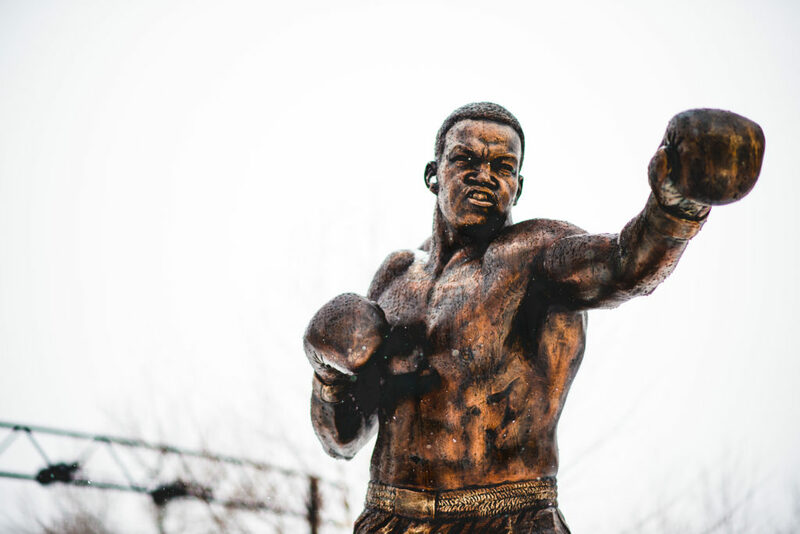 Jutting into the confluence, Scott Park boasts a 19,000-pound bronze statue of Easton’s own Larry Holmes (the “Easton Assassin”), who held the heavyweight boxing championship title from 1978 to 1985. Now in his late 60s, he’s still a hometown hero. Holmes is just one more piece of Easton’s dynamic identity. Nowadays, GEDP’s mission for the city focuses on “economic well-being, historical integrity, programmatic development, vibrant culture and urban hospitality.” That’s a lot, and separate initiatives under the GEDP umbrella tackle each goal. 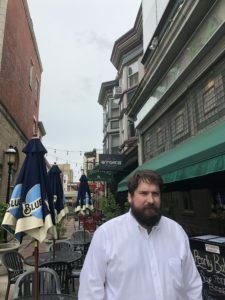 The nonprofit, volunteer-run Easton Main Street Initiative (EMSI) focuses on Easton’s central business district (encompassing 20 square blocks) and capitalizing on the advantages of being a college town. Since 2008, the Easton Ambassadors have upheld quality of life for business owners, residents and visitors by lending a hand with everything from picking up trash to planting gardens to shoveling snow. 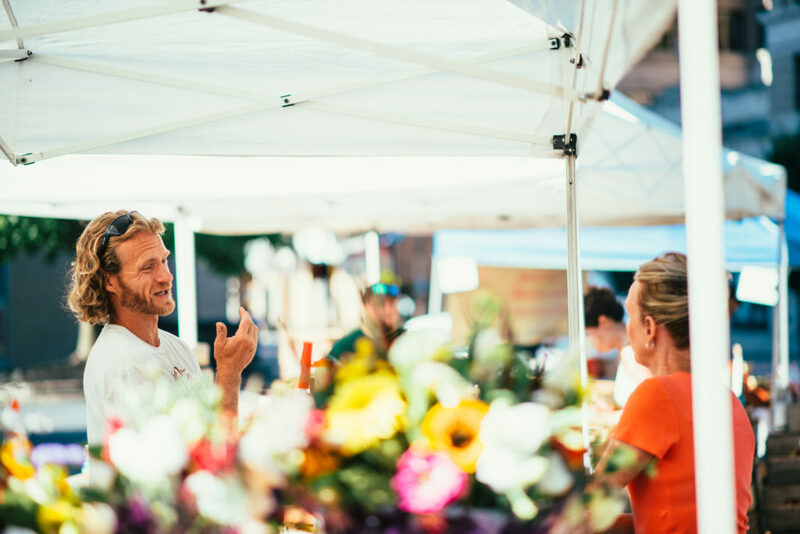 And the Easton Farmers’ Market, operating since the mid-18th century in Centre Square, connects regional farmers directly to consumers, providing a critical platform for local vendors, and drawing thousands to festivals throughout the spring, summer, and fall season. From Scott Park, Mast leads the way back to Northampton Street, where a small, blue “Welcome to Pennsylvania” sign greets drivers on the narrow green bridge from Phillipsburg. We head west, back toward Centre Square, while the Grand Eastonian looms on the other side of the street. Its stately brick façade is another example of how Easton has evolved while honoring its history. Originally built as the ten-story Hotel Easton in 1926, the building’s design straddled traditional and 20th-century high-rise architectural styles, helping put Easton on the map as a modern city. It became an important hub for city events and an anchor of the historic district, but it was abandoned in 1989. In 2004, it was renovated and reopened as condominiums, retaining many of its original interior and exterior flourishes. Today, it’s a hotel again. Not that Mast needs a place to stay: He’s an Easton native who did his undergrad at Lafayette College, where his mother worked; his father was a basketball player and later a local entrepreneur. After graduation, Mast lived and worked in California for several years. During that time, his interest in community development crystallized with the realization that this work happens on many different scales, from city and regional government to nonprofits and business development. He decided to return to school for a master’s degree in city planning from Cornell University. Mast took the economic and real estate track in his degree from Cornell, and before graduation, was already involved with EMSI, so staying in Easton was a natural fit. Nowadays, he notes, the field of economic development is welcoming more young workers into the ranks, as well as women. And this is a career you can approach from many different angles. “It’s not like you go to school for economic development,” he says. If professionals don’t find their way to the field through city planning, they can come from civil service backgrounds, or nonprofit work, or social justice activism. Some economic development professionals have MBAs, and some don’t have a graduate degree at all, but go on to earn credentials through the Pennsylvania Economic Development Association. The digital revolution has provided new tools, says Mast, with unprecedented access to data, case studies, and virtual mentors that result in evidence-based best practices, rather than experiments without context. For Mast, his career in Easton is personal. Ultimately, supporting your home city isn’t just about rooting for the home team. ALAINA MABASO is a Philadelphia-based freelance writer and the associate editor of BroadStreetReview.com, Philly’s hub for arts, culture and commentary. You can visit her at her blog, where fiction need not apply.